Paul Allen And Steve Jobs – Both Left Us Early! Paul Allen, co-founder of Microsoft died yesterday, Oct. 15, 2018. His untimely death reminded me of Steve Jobs, co-founder of Microsoft who died Oct. 5, 2011. Allen co-founder Microsoft in 1975 and Jobs co-founded Apple in 1976. Allen was 65 and Jobs was just 56 at time of death. Both were pioneers in the IT Revolution. Both dropped out of college. Both accumulated $20B of wealth in today’s money. 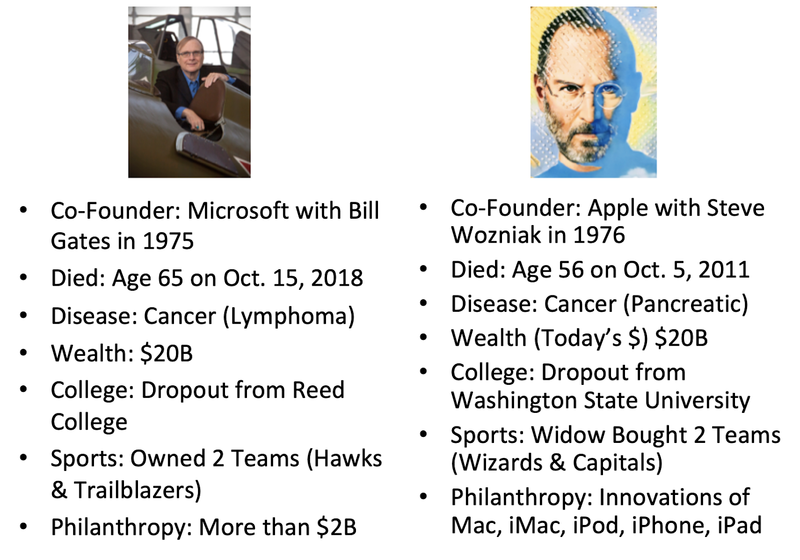 Both were huge philanthropists in terms of what they left the world: money in Allen’s case and many innovations in Job’s. Both have been in Time’s 100 Most Influential People. Both died an early death–sadly too young! This entry was posted in Apple, Billionaires, Cancer, Comparison, Contributions, Died Young, Disease, Dropout, Early Death, Graphic, Influential, Information Technology, Life and Death, Microsoft, Paul Allen, Philanthropy, Pioneers, Uncategorized, Wealth. Bookmark the permalink.